Most people want to work in a call center because of the assumption that employees who are working in the BPO industry earns a lot. This may be true for some companies however; the salary would be based on the years of experience and the complexity of work. If you have not been employed in a BPO industry we envy you since you have been living a "normal life" and you have not encountered being shouted at by angry customers on a daily basis. For us who's already inside the industry the videos below are source of good laughs. If you still want to pursue working in a call center we suggest seeing it to learn more on what we deal with every day. 1. First, if you want to get in you need to prevent interview boo-boos watch the video entitled "Funny Call Center Job Interview Questions and Answers". 2. So you have prepared for the interview and were able to get in. It's time for your first call if you are assigned as an outbound specialist there's a high chance that you will encounter this type of customers. 3. If you are a techy person then a Tech Support role is good for you. Check how a tech support call is done. 4. Still want to get in? 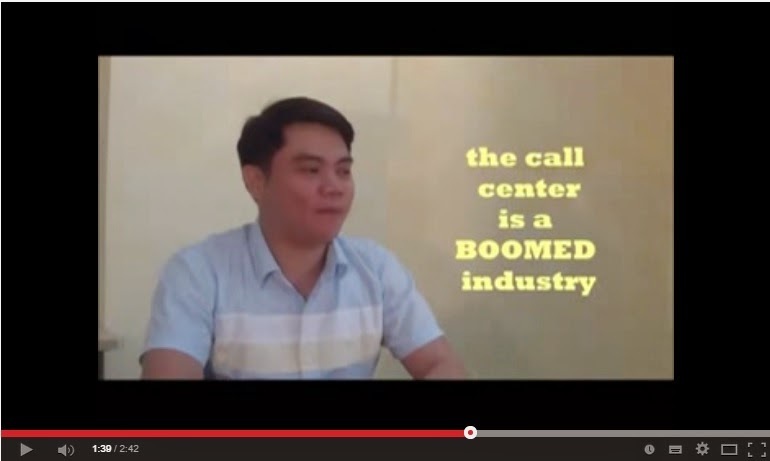 The 4 minute video below would provide you a bird's eye view on how it really looks like working in a call center. 5. After watching the four videos above you might have come to a point of giving up your dreams of working in a call center. Don't lose hope there are companies that offer local accounts. Yes, no EOP (English Only Policy) only TTT(Talking Tagalog Time). Listen for the sample call below. Note: This is not a scandal that you think of okay, the video uploader named it that way. Now that you have an idea on the type of calls and work scenario that you will encounter in a call center environment think twice or even thrice if you still want to pursue a BPO career then we salute you. The one million BPO Filipino employees are willing to welcome you on board. In case you have questions proceed to the comments section and we will be more than happy to assist you (LOL closing spiel)!